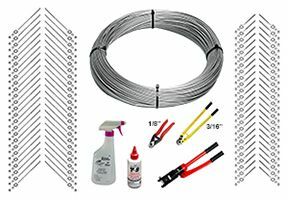 Below are kits containing various lengths of our 1x19 Marine Grade Stainless Steel Cable and our best-selling standard field-swage end fittings. If none of our kits work for your specific project, fill out our Free Estimate Request Form. Our estimators will contact you shortly to help you design and order the railing system you need.